Page last updated on: Monday, 10 October, 2016. Our web-page "Anwoth Parish Transcriptions" contains details of all burials and gravestone transcriptions of which we are aware. If, having looked at that searchable text page you find a gravestone that you would like to see, then come to this page and search for the relevant grave reference, then download the relevant .pdf file. Note that the surname associated with each lair is often that of the grave owner, which in some cases differs from the name(s) on the headstone. Remember to use your browser's "Back" button after viewing the .pdf of a gravestone (otherwise you will close your internet session). Graveyard overviews from the pedestrian entrance (NW corner). Graveyard overview from the SW corner. 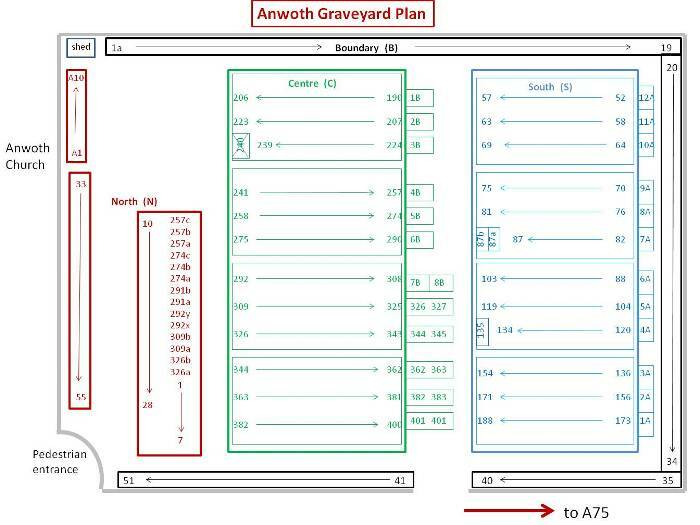 The graveyard plan below uses the same layout and numbering convention as used by the Dumfries and Galloway Regional Council in their "Lair Plans". There are 4 sections. The Boundary section has graves along the east, south and west walls - it is highlighted in black on the plan, and lairs are prefixed with letter B. The South section is a rectangle and is coloured blue (prefixed S). The Centre section is rectangular and coloured green (prefixed C). The North section, coloured red-brown, (prefixed N) is effectively 3 rows of graves, but the numbering system is a little unconventional. The image below shows the eastern boundary wall against which are plots 1 to 19. In the early years, families would purchase 3 neighbouring lairs as a single plot, and the headstone would usually be placed above the middle of the plot. Lairs would be 6 feet deep, the first coffin would be buried at 6 feet, and another one at 4 feet 6 inches. Above this is room for a number of caskets which contain ashes. Around the middle of the 20th century, it must have become obvious that the graveyard was filling up too quickly, charges increased, and lairs were sold and numbered individually. (from lair S88 onwards). 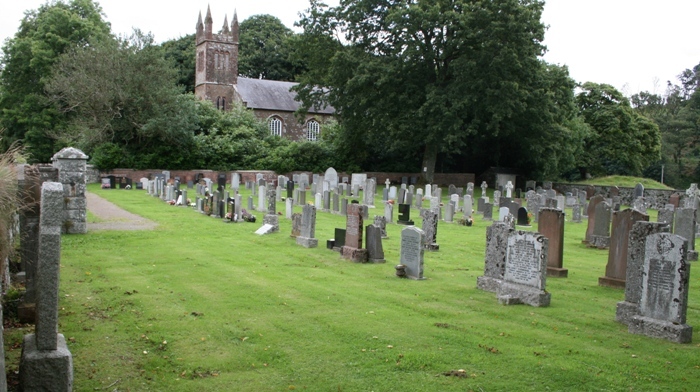 The image above shows the shed in the corner and headstones B1, B2 & B3. The above shows the west boundary wall from the south wall corner to the vehicular entrance. B35 to B40. The above shows the west boundary wall from the vehicular entrance to the pedestrian entrance . B41 to B51. The front line of 5 headstones from L to R are nos. S52 to S56. There is no stone for plot S57. This row of graves is back-to-back with the row above. 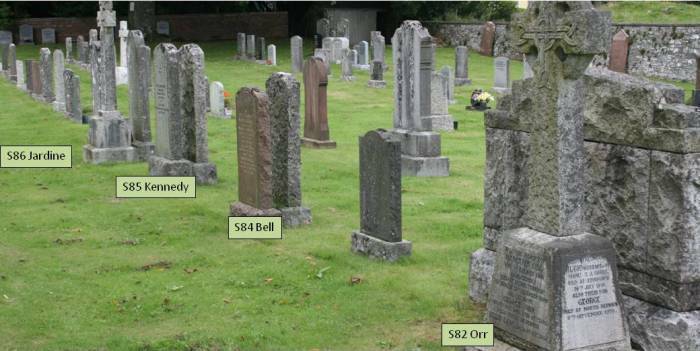 Previous graves are referred to by a plot number, where plots typically contain 3 lairs. From here onwards graves are listed by lair numbers. This row is back-to-back with the row above.